This morning Rumpy decided he wanted to sit outside awhile in the cool morning air, so I took the opportunity to give his coat a good brushing. I was able to get a good bit of that undercoat off of him. I haven’t been as attentive to Rumpy’s coat as I should, and it shows. While I was brushing him, I thought, “I wish I could just shave all this off and start all over again.” Maybe you’ve wondered if you should shave your dog. Before you do that, I suggest you research your dog’s breed. With Alaskan Malamutes and Huskies, the coat is thick in the winter to keep the dog warm. But it also acts to cool the dog in the summer. Shaving these breeds is not advised, because without the coat they cannot regulate their temperature and are at greater risk of heatstroke. The skin is also subject to sunburn. Rumpy and I take our walks in the morning when it’s cool outside; on my days off we sometimes take two morning walks. I also offer him the opportunity to walk in the evening. Sometimes he will, and sometimes he won’t. He knows what’s right for him, and I trust his judgement. We stick to shadier streets to walk down. And I monitor him to make sure he’s OK. Enjoying a cool breeze blowing our way. 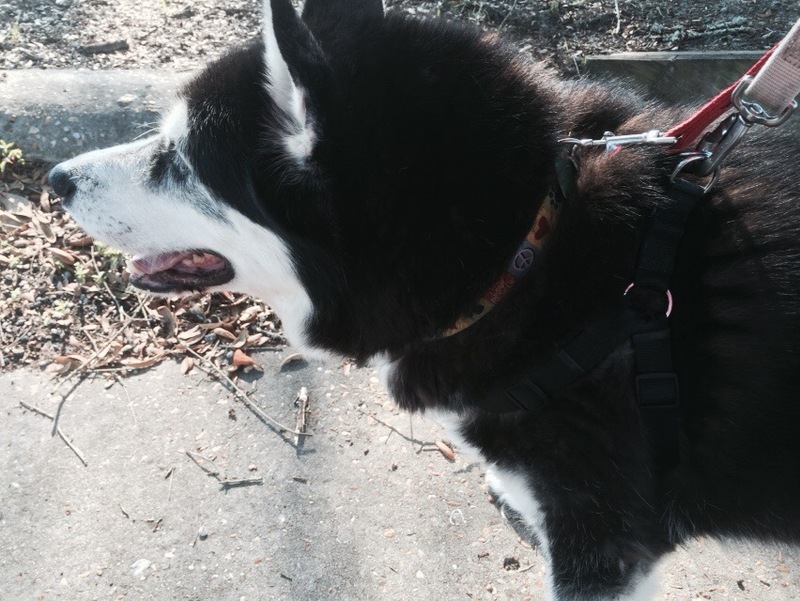 Florida is not an ideal climate for an Alaskan Malamute, but Rumpy is an inside dog, so he’s fine. Keeping a Malamute or Husky outside in this climate is not a good idea. A Malamute’s body temperature averages to 101F, and can quickly go over 103F, which puts him or her at risk of heat stroke. Darker coats, like Rumpy’s, absorb heat, and put the dog at even more risk. 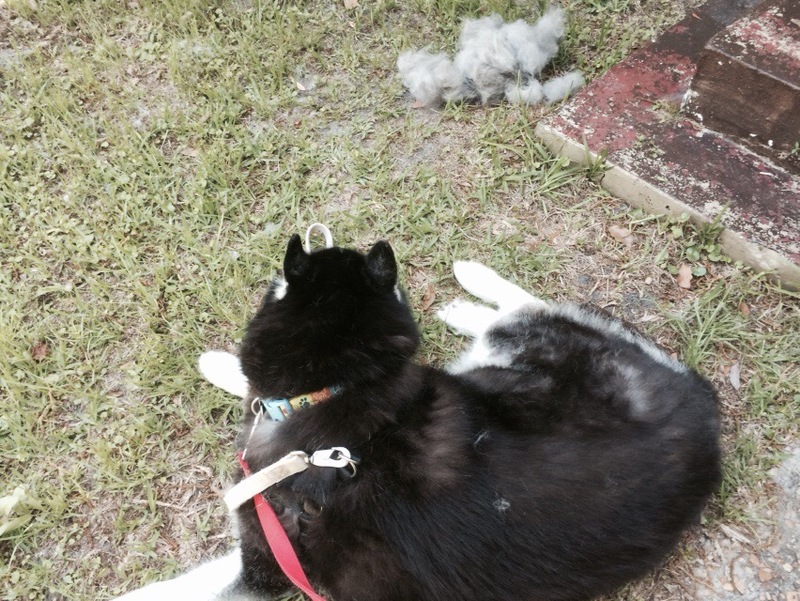 Shaded yards, wading pools, ice blocks, and cooling fans all help when your dog is outside, but a Malamute in Florida really shouldn’t be outside in the heat of the day for long periods of time. A coat like Rumpy’s needs to be brushed regularly. Honestly, a daily brushing would be ideal for Rumpy, but it’s not happening now. I do brush regularly, to get the leftover winter undercoat loosened. Now that it’s warm outside, it’s time for his annual bath. That’s right, an Alaskan Malamute grooms itself, so regular baths aren’t necessary. But he does need one a couple of times a year, and now’s a good time to get the rest of that undercoat off him. Do you know what’s recommended for your breed of dog? If not, I suggest the web site of a reputable breeder. While you may think asking your vet is a good idea, I actually had a vet once tell me I should get Rumpy shaved, and I had to school him on why that’s not a good idea. He wasn’t happy that I bruised his ego, but hey, no one knows everything! What summer care does your breed of dog require? Very interesting to know! Most would not think heavy fur would cool them as well. I had friends in college who collected their huskies’ fur and spun it into yarn because it didn’t have the “dog” smell since they groom and it’s somewhat waterproof and nice and warm. I’ve seen dog-hair sweaters since then too. McKinley is a mutt (half Jack Russell, half mini-Doxie) and she has a relatively thick coat (not sure where that came from) that is regularly brushed both to keep the shedding down and for the purposes of bonding/grooming. I’ve never considered shaving her. Not only would she have a nervous breakdown, but dogs have coats for a reason. We humans need to be responsible for keeping them from being overheated and providing lots of water in the summer. She’s an indoor dog as well. Poodles and some other breeds with hair rather than coats are a different issue. We have never understood the concept of shaving all of the hair off of a dog. Brushing is good for the dog. Hair is there for protection. we agree with you. This post reminds us that humans always have to remember what is the best for our companion animals when we live together or we might hurt them. There are still lots of things we should study…. We are brushing, brushing, brushing. Molly is must manufacture additional hair each night. This past week has been cool so we’re having as many outings as possible before summer hits – then it’s just chill indoors or maybe a splash or two in a wading pool. Mostly low keyed action until fall. Paw waves to Rumpy!